The silly photos. The touristy behavior. And the chaos — oh, the chaos! If I had to pick just three of the most embarrassing things families do while they travel, those would be the ones. I’ve been thinking a lot lately about how families make fools of themselves on vacation. That’s because my kids are engaging in more cringe-worthy behaviors as they become teenagers. They include taking photos and videos that must never find their way to social media, being disruptive, and disturbing the peace. Just yesterday, I heard a knock at the door of our vacation rental. When I opened the door, I was facing a large bearded man wearing a sleeveless Harley-Davidson T-shirt. “I’m your neighbor downstairs,” he announced. I immediately knew what we’d done — or, more precisely, what my youngest daughter and son had done. They were loud. They played “catch” right above his bedroom and even when I begged them to quiet down, they ignored me. Mr. Harley was tough to ignore now that he was standing there in the flesh. After they met Mr. Harley they never ran in the house again. When it looked as if they might, I reminded them that Mr. Harley probably had friends who were in a motorcycle gang. That’s all it took. I wish it were always that easy. But it isn’t. 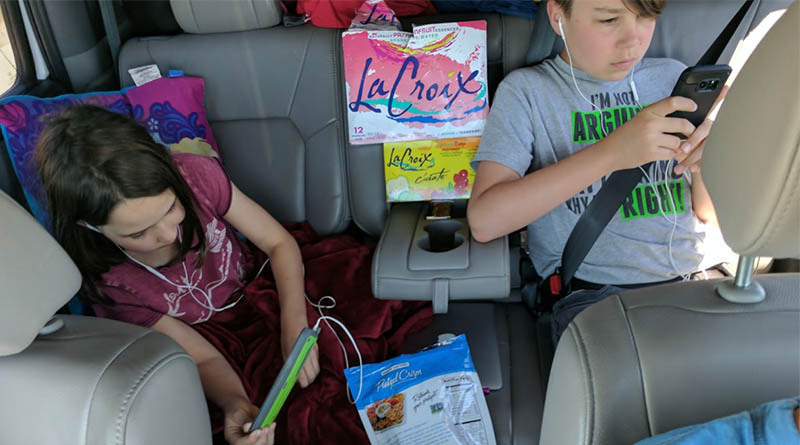 That’s why it’s worth taking a closer look at the ways families embarrass themselves on vacation, and how to avoid trouble. 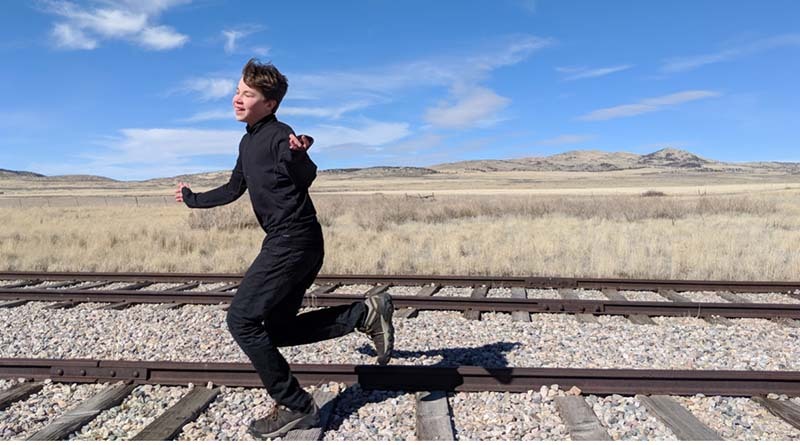 Iden runs along an abandoned track at Golden Spike National Historic Site in Utah. A posed photo? You decide. When you travel with your family, it seems there are only two kinds of photos you can take: pictures of the scenery around you and posed photos. I’m only exaggerating a little. Once the kids see your camera or phone come out, they put on a goofy face and start to prance around like gazelles. Some families have turned the posed photo into art. You don’t have to look far to see families-on-vacation pictures — in front of the Eiffel Tower, the Statue of Liberty, In-N-Out Burger in Glendale. They do funny things in those photos like wear silly grins or make that heart shape with their hands, which I find really annoying. I’m one to talk. We have albums of posed photos from several continents on Google, many of them so embarrassing that I can’t share them or even write about them. But my New Year’s resolution for 2019 was to stop taking them. How do you do that? Institute a “no posing” rule. Be discreet about the phone. Keep ’em guessing — is he checking his email or taking a picture? Kids do the strangest things when they know there’s a lens trained on them. Refuse to take a photo of a child who is dancing around like a monkey. Actually, that brings me to my next point. Aren Elliott at the Portland Art Museum in 2017. Museums are not for sleeping — or are they? I admit we behave like tourists because we are tourists. But do we have to be such obvious visitors? No, we do not. And I’m not even talking about staring at the skyscrapers in Manhattan or running through the waves in Waikiki as if it’s the first time we’ve seen the ocean. 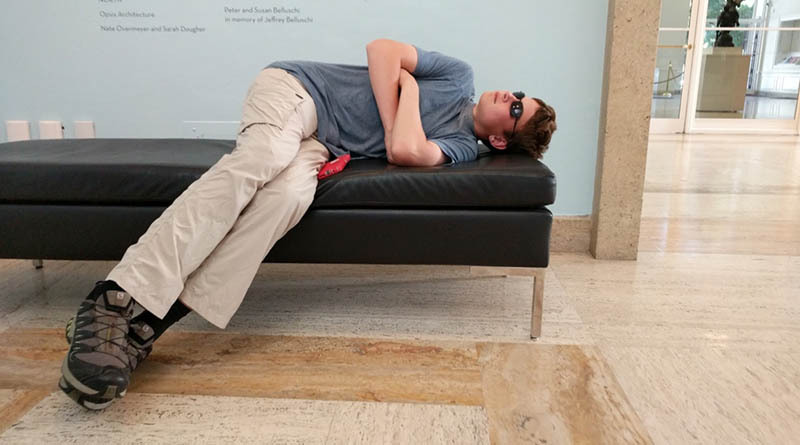 Sometimes, tourists do inappropriate things like trying to take a nap in a museum (see the picture of my oldest son above, caught in the act). Sometimes, they just walk into traffic, expecting the world to stop as they take a picture of a statue or building. I asked my kids about the most touristy thing they’d ever done. They both said “ziplining.” True, ziplining is touristy. But after a while, they revised their answers. “Shopping,” admitted my 12-year-old daughter. She hates shopping. Buying stuff makes no sense to her, and especially if she’s purchasing souvenirs that end up collecting dust in the basement. That said, she says she likes going to some shopping malls, the Ala Moana mall — a vast outdoor shopping district in Honolulu — being her favorite. You can avoid touristy behavior by refusing to do what everyone else is doing. That’s always a good idea when you’re on vacation because you’ll not only avoid standing in ridiculously long lines, but you’ll also have a unique experience away from the beaten path that’s been covered to death by my colleagues in the travel writing community. How can you tell if you’re doing something touristy? To paraphrase Supreme Court Justice Potter Stewart, you’ll know touristy behavior when you see it. The back seat of our Honda Pilot in Texas in 2017. Chaos! Families are chaotic. But put a family on the road, and the chaos spreads unchecked. The back of the car, which used to just be cluttered, now looks as if a small tornado has passed through it. Your hotel room is in such disarray that you don’t know where the bed ends and the carpet begins. I wanted to show you more pictures to prove this wasn’t just hyperbole, but my kids wouldn’t let me. I don’t know why everything becomes disorganized, but I think I have a solution: declutter. Get rid of the things that contribute to the chaos. In my family, it’s the extra gadgets, toys, blankets, and other items that don’t belong on the trip. If nothing else, these items lead to embarrassing vacation photos of the back of your car like the one I just shared with you. I harbor no illusions about changing the world. My rants will probably not reduce the number of cringe-worthy family vacation photos. Nor will they stop families from doing touristy things. But they might rein in the chaos just a little.